At 26630 Drifter Drive, you’ll be part of the Sun Lakes, AZ active adult retirement community located in the East Valley of the Phoenix area. Whether you are looking for a year round home or a winter vacation get-a-way, we have you covered! 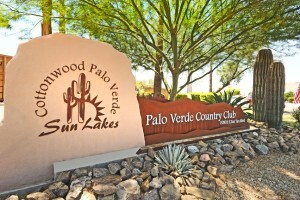 Sun Lakes offers real estate in five separate communities. Our newest listing at 26630 S Drifter Drive is located in Cottonwood Country Club. Sun Lakes Realty is offered by The Kolb Team, specialists in active adult retirement communities. Cottonwood Country Club features an 18-hole Championship Golf Course, tennis and pickle ball courts, swimming pools, hot tub and much more! Entertainment is popular in the Cottonwood Bar and Grill as well as the Cottonwood Ballroom. Take a walk around the lakes on the walking path or sit on a bench and read a book in a tranquil setting. Features of 26630 S Drifter Dr.
You will fall in love with this well maintained Santa Fe style home located in a quiet cul-de-sac. Some features include vaulted ceilings, water softener, skylights, wood burning fireplace, wood shutters throughout, neutral flooring and lots of storage. The large master suite includes a double door leading to the covered patio with pergola where you can bask in the sunshine or sip coffee and catch up on the news. Enjoy the master suite with dual sinks and a walk in closet. The guest suit is light and bright with an updated bathroom, newly tiled shower, updated sinks and more. An additional room off the living area can be used as an office, craft room or den. An Arizona room with Pella sliding doors is a perfect place to read, entertain or enjoy a meal. There will be plenty of time to enjoy the resort amenities with the large low maintenance back yard with water feature and fruit trees. And, the roof coating has a 5 year transferable warranty. Need storage? The garage has attached cabinets plus a separate room with a utility sink, and soft water system. Are you ready to see 26630 S. Drifter Dr.? If you are ready to start enjoying Sun Lakes Realty with friends and neighbors from all over, call us at 480-440-0849 or contact us here.